Ruby on Rails is a leading web application development framework, based on the Ruby programming language. It is designed to eliminate much of the drudgery of writing typical web applications by providing default settings that eliminate most configuration code (“convention over configuration”) and by providing a rich set of utility functions that make most common tasks simple. It uses a model-view-controller design pattern. With the various characteristics of Ruby on Rails like approach, Convention over configuration, Do not repeat yourself (DRY), Model view controller (MVC), Active record patterns etc., it has been adopted as an outstanding platform for web application development. Some of the most popular web applications powering successful business are built on Ruby on Rails.The approach adopted by Ruby on Rails for building web applications is very simple and consistent. The outstanding architecture of Ruby on Rails solves the common architectural problems of persistence, logging, build scripts, application configuration, web-tier components and workflow that existed with the traditional web applications development. This helps the web development process to become more productive in lesser time. Model View Controller (MVC) which ruby on rails follows the architecture, MVC helps in addressing the issues of code re usability and separation of concerns. The model consists of application data and business rules, and the controller mediates input, converting it to commands for the model or view with the help of Ajax, Backbone etc. MVC can be executed partly on the client without having to send hyperlink requests to retrieve the complete page. The support for agile development is also integrated into the developer engineering practices with readily available tools like Jenkins CI for continuous integration, Cucumber for test driven development, and Capistrano for deployment. Project collaboration tools like Jira, and Pivotal tracker offers integration to Ruby on Rails environment for effective backlog management and issue resolution. Few of the popular names associated with Ruby on Rails for building their applications are Basecamp, Twitter, Shopify, Yellow pages, Groupon etc. These names speak for themselves and their association with Ruby on Rails justifies the leading position in the current market scenario. These are not the only ones which have their web applications built using Ruby on Rails but almost 239,522 sites use Ruby on Rails. This huge number reconfirms the market share of Ruby on Rails and the bright future ahead. Compatibility with Cloud: Numerous e-commerce, social and enterprise applications are built on Ruby on Rails and hosted on many cloud platforms supporting Ruby on Rails. Ruby has already been named as the “Language of the cloud”, which is evident already, as companies like Heroku, Engine Yard and Morphlabs are utilizing Ruby at its fullest to glue their cloud platform. Ruby on Rails is a compelling option for companies migrating from server based legacy products to modern web applications. Cloud management has also become easier with inherent support for elasticity and auto scaling offered with Ruby on Rails making transformation to cloud seamless. This frameworks is indeed helpful for developers as it generates a quality of code and aids them to remove errors by highlighting. The produced code is fully free from any sort of bugs and errors and always ensure quality structure. A number of facilities and features are available in Rails language that can turn an ardent task of developing the web apps into agile development. Furthermore, it is quick to launch the app aptly without hassle. The web applications built with ROR support multi-platforms provides the best in class flexibility to reuse the code aesthetically. Total cost of built web app is quite low than the apps that are powered by other technology and programming languages. It holds a vast library, rich with numerous features that can help you produce better results in very less time. Gems are considered in the world’s cutting edge plugins that are primary part of RoR framework. Conclusion:The most important benefits of Ruby on Rails as a web development platform as it supports rapid development, is flexible and gives a lot of importance to collaboration over convention. 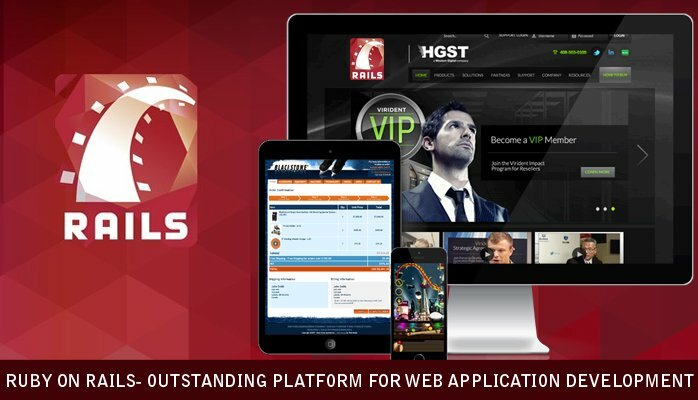 All this makes Ruby on Rails a preferred choice for web application development.